I called out into the falling snow as I rounded the corner of the bottom field – the one nearest the house where the carcass of the original Victorian farmhouse still stood in one corner, just broken walls now as if it had already been picked over for carrion. Update: “Shades of Santa” appears to be currently out of print. 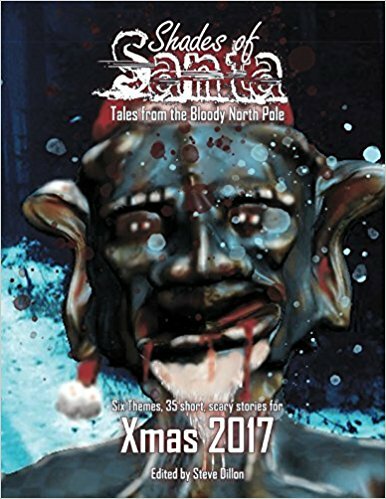 “Shades of Santa” is something a little different: a holiday themed anthology of dark stories, each 666 words long and based on one of six categories. All the profits from sales of the book will be going to Charity:Water to help communities have access to clean drinking water. My story, Snow Drifts, got into the book under the “Snow People” category. It’s a little weird tale that leaves things with a slightly ambiguous twist at the end. I’ll include my Amazon advertiser link to the book below – if I make any advertiser fees from this book I’ll donate them to the charity as well.